Crown Heights is the parent company of CrownTV. 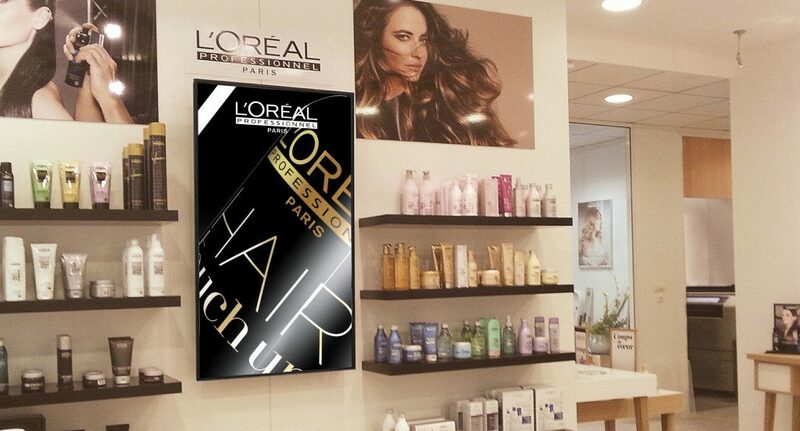 48: The number of L’Oréal-partnered hair salons equipped with digital displays by the expert in digital signage solutions, CrownTV, since the month of June. The window display plays a crucial role in the client entering the salon. “It must make the client want to go into the salon based on the information about the salon, on its expertise, on brands and innovations. It’s why we recommend digitalization so that it will be impactful and attractive,” Tania continued. It’s an argument supported by key figures: brands using screens in their window displays saw their traffic grow, on average, 33% and their sales revenue increase 24% (source: Popai, 2014). It’s Crown Heights/CrownTV, creator/integrator of these solutions and specialist in the expansion of brands with sub-brands, who won the tender launched by L’Oréal. “Specifically, we regularly offer video content (new developments concerning our brands Kerastase, L’Oréal Professional, product innovations, promotional videos) that Crown Heights/CrownTV makes available to hair salons in ‘a media library on the cloud’,” describes Tania. To simplify the distribution of content, the provider launched two web interfaces: the first, given the distinction “super-admin”, manages and dictates the content for the entire network of sub-brands. “For example, a network head defines a certain type of content by store and we distribute the requested content on each screen,” details Tristan Dupont, business director at Crown Heights/CrownTV. A second interface, one for clients, was created for the point of sale. “It allows the store manager to have a hand in what is on their own display screen,” Tristan specifies, “and to manage its communication in an autonomous way.” Simple and effective. Schedule a demo to see how CrownTV can benefit your salon or spa.